We are at a critical juncture in stopping a disastrous deal that will legitimize Iran’s nuclear weapons and missile programs. President Barack Obama tells us the agreement will prevent Iran from obtaining a nuclear weapon, but the truth is that he's desperate to get a deal - any deal. And it’s not just we here at CHQ that see this deal as an existential threat to the United States and a deep betrayal of American national security interests. According to The Wall Street Journal, "President Obama said Tehran could receive significant economic relief IMMEDIATELY after concluding a deal..." The Iranian regime will use it to pay for more terrorism, more regional subversion, more ballistic missiles AND to get the bomb. The existence of such a network should add to Western concerns over whether Tehran can be trusted to adhere to a nuclear deal due by June 30 in which it would agree to restrict sensitive nuclear work in exchange for sanctions relief. The United States and the International Atomic Energy Agency have repeatedly said that Tehran has so far complied with the terms of a limited agreement struck in November 2013... The panel said it had received no new reports from U.N. member states of confirmed cases of non-compliance involving Iranian nuclear procurement. However, it cautioned that the lack of such reports could be due to multiple reasons. "The current situation with reporting could reflect a general reduction of procurement activities by the Iranian side or a political decision by some member states to refrain from reporting to avoid any possible negative impact on ongoing negotiations between ... Iran and (major powers)," it said. Despite the lack of newly confirmed violations the panel said that "some member states informed the panel that according to their assessment, the Islamic Republic of Iran's procurement trends and (sanctions) circumvention techniques remain basically unchanged." Iran's ongoing illicit activities are unchanged, and yet there's been a complete drop-off - zero new reports - from member states who are supposed to track those activities. The conclusion from the panel is that there's been "a political decision by some member states to refrain from reporting to avoid any possible negative impact on ongoing negotiations." That's a somewhat-but-not-really polite way of accusing governments of politicizing intelligence on Iranian cheating, which would make it awkward to sell an Iran deal to skeptical publics and legislators says Ceren. Marina Shalabi and Ian Duff / WINEP -- Changing Iran Trends in the Worldwide Threat Assessment -- The past two editions of the annual intelligence report show a marked shift away from discussing Iran's hegemonic regional ambitions and terrorism sponsorship. Michael B. Mukasey and Kevin Carroll / WSJ -- The CIA Needs an Iran 'Team B' -- John Brennan has put the spy agency in an impossible position regarding analysis of Iran’s nuclear program. National security writer and analyst Omri Ceren says, and we agree whole heartedly, that the administration will have even more incentive to suppress intelligence on Iranian misbehavior in the aftermath of a nuclear deal. The stakes will be higher and confirmed Iranian cheating - which would lock in the perception that the Americans got played for chumps by the Iranians - would be unspinnable. 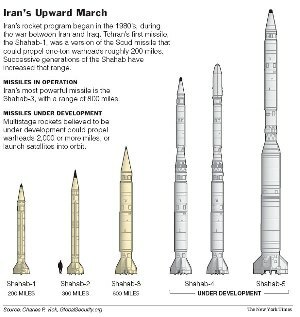 Unspinnable, and too late to stop Iran’s nuclear weapons and missile program from reaching its goal of developing an offensive capability to attack the United States. Cloture on debate on Tennessee Senator Bob Corker’s “Iran Nuclear Agreement Review Act of 2015,” has been filed in the Senate, there will be no more debate, no more amendments allowed in the Senate. We've told you what we think of the Corker bill -- that it's tantamount to treason -- in our articles The Depth of Republican Perfidy on Obama’s Iran Nuclear Weapons Deal, None Dare Call Them Treason: Obama’s Iran Nuclear Weapons Deal & the Corker Bill and Republican Senator Bob Corker Is A Traitor and that's a conclusion shared by our friend Ben Weingarten of The Blaze in his outstanding article “Iran Literally Fired a Shot Across an American Ally’s Bow, But Obama Won’t Dump His Disastrous Deal”. We have one last opportunity to tell the Senate to do its duty as a check and balance on this national security malfeasance by President Obama. Our friends at Secure Freedom have launched a powerful one minute video on this topic at their new IranTruth.org website. You can also link directly to the video through this link. It is optimized to go viral and launched yesterday with the hashtag #NoIranBombBonus. We must keep in place the policy against Iran acquiring nuclear weapons that has provided America with an unassailable lead in military power for the past 40 years. We urge conservatives to contact their Senators and Representative (the Capitol Switchboard is 1-866-220-0044) and to use their social media channels to demand your members of Congress vote against the Corker bill and Obama’s nuclear weapons deal with Iran.